Scorpius constellation lies in the southern sky. It represents the scorpion and is associated with the story of Orion in Greek mythology. Scorpius is one of the zodiac constellations, first catalogued by the Greek astronomer Ptolemy in the 2nd century. Its symbol is ♏. 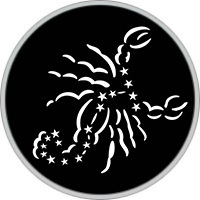 Scorpius pre-dates the Greeks, and is one of the oldest constellations known. The Sumerians called it GIR-TAB, or “the scorpion,” about 5,000 years ago. The constellation is easy to find in the sky because it is located near the centre of the Milky Way. It contains a number of notable stars and deep sky objects, including the bright stars Antares and Shaula, the Butterfly Cluster (Messier 6), the Ptolemy Cluster (Messier 7), Cat’s Paw Nebula (NGC 6334), the Butterfly Nebula (NGC 6302), and the War and Peace Nebula (NGC 6357). 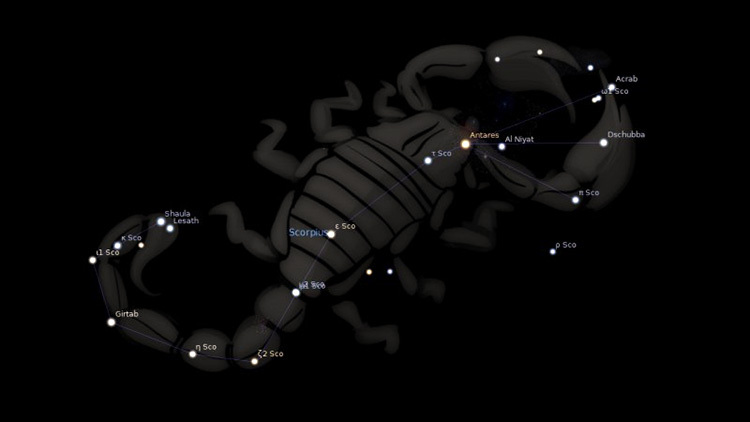 In Greek mythology, the constellation Scorpius was identified with the scorpion that killed Orion, the mythical hunter. The two constellations lie opposite each other in the sky, and Orion is said to be fleeing from the scorpion as it sets just as Scorpius rises. In one version of the myth, Orion tried to ravish the goddess Artemis and she sent the scorpion to kill him. In another version, it was the Earth that sent the scorpion after Orion had boasted that he could kill any wild beast. In ancient Greek times, the constellation Scorpius was significantly larger and comprised of two halves, one with the scorpion’s body and the sting, and one containing the claws. The latter was called Chelae, or “claws.” In the first century BC, the Romans turned the claws into a separate constellation, Libra, the Scales. How to find the constellation Scorpio in the sky? Scorpio takes up an area of 497 square degrees of the celestial heavens, making it the 10th largest of the 12 zodiac constellations. It can be seen from between latitudes of +40° and -90° where it is found in the direction of the Milky Way nestled between the prominent constellations of Libra to the east, and Sagittarius to the west. Other neighbouring constellations include Ara, Corona Australis, Norma, and Ophiuchus. Since it closely resembles a huge scorpion, it is almost impossible to miss in the sky. Look for the vivid red star Antares that forms its heart, and the shape of a scorpion will jump out at you. In the northern hemisphere, the best time to observe Scorpio is during the summer months of July and August, when it can be seen traveling low along the southern horizon. In the southern hemisphere, it can be seen from March to October. Each year the Sun passes in front of this constellation for just one week between November 22nd and November 29th, the shortest amount of time by any of the constellation of the Zodiac. But remember this applies to the constellation Scorpio, and not the astrology sign Scorpio, where the Sun is assumed to pass through between October 23rd and November 21st.